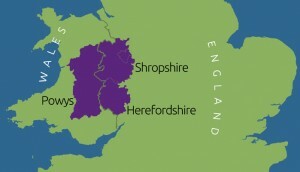 TriCounty, as the name implies, covers three county areas across the border between Wales and England (see map in sidebar); Powys (the largest county in Wales), Shropshire and Herefordshire. To help you make your arrangements to travel here we’ve put some links below to useful sites for those travelling by road, rail and air. Your local train stations are Knighton, Ludlow and Craven Arms. To make contact with us directly about travelling and pickups for tours please use the information on the Contact page.